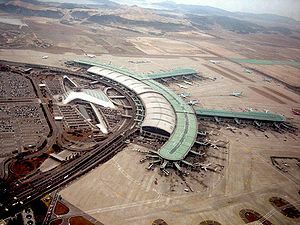 An aerial view of Incheon International Airport, a large airport. An airport is a facility where aircraft, such as airplanes and helicopters, can take off and land. A military airport is known as an airbase or air station. The terms airfield, airstrip, and aerodrome may also be used to refer to airports of varying sizes. An airport consists of at least one runway or helipad (for helicopters), with other components such as terminal buildings and hangars. Additionally, an airport may have a variety of facilities and infrastructure, including fixed base operator services, air traffic control, passenger facilities such as restaurants and lounges, and emergency services. In some jurisdictions, the term airport is used where the facility is licensed as such by the relevant government organization (including the U.S. Federal Aviation Administration (FAA) and Transport Canada). Elsewhere, the distinction is merely one of structural and functional features. Airports have made and continue to make major contributions to the growth and development of civilization. They have been critical in organizing air traffic, facilitating the transport of people and cargo, and transforming the world into a global village. In some cases, entire cities have been built around a main airport. In addition, cultures and ecosystems have evolved around airports. This is similar to the way seaports made a difference in the development of coastal towns. The growth of towns and cities has been linked to their development into hubs of transportation. This is no exception with airports. 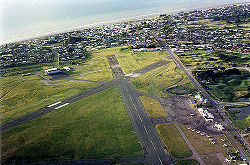 An aerial view of Paraparaumu Airport, a medium-sized airport. 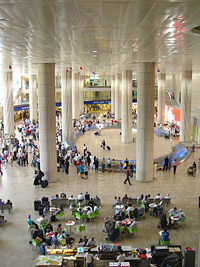 Arrivals Hall of the medium-sized Ben Gurion Airport. Airports vary in size, with smaller or less-developed airports often having only a single runway shorter than 1,000 meters (m) (3,300 feet). Larger airports for international flights generally have paved runways of 2,000 m (6,600 ft) or longer. Many small airports have dirt, grass, or gravel runways, rather than asphalt or concrete. An aerial view of the Toronto/Markham Airport, a small airport, in the winter. 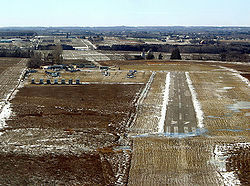 In the United States, the minimum dimensions for dry, hard landing fields are defined by the FAR Landing And Takeoff Field Lengths. These include considerations for safety margins during landing and takeoff. Typically, heavier aircraft require longer runways. The longest public-use runway in the world is at Ulyanovsk Vostochny Airport, in Ulyanovsk, Russia. It has a length of 5,000 m (16,404ft). At 105 m (344ft), it should also be the world's widest paved runway. A view of the Frankfurt Airport terminal showing jetways and luggage carts. Airports are divided into "landside" and "airside" areas. Landside areas include parking lots, public transportation stations, tank farms and access roads. Airside areas include all areas accessible to aircraft, including runways, taxiways, and ramps. Access from landside areas to airside areas is tightly controlled at most airports. Passengers on commercial flights access airside areas through terminals, where they can purchase tickets, clear security, check or claim luggage, and board aircraft though gates. 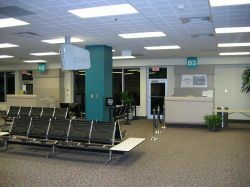 The waiting areas which provide passenger access to aircraft are typically called concourses, although this term is often used interchangeably with terminal. The area where aircraft park next to a terminal to load passengers and baggage is known as a "ramp" (or, to the media and uninitiated, "the tarmac"). Parking areas for aircraft away from terminals are generally called aprons. Both large and small airports can be towered or nontowered, depending on air traffic density and available funds. Due to their high capacity and busy airspace, most international airports have air traffic control located on site. Airports with international flights have customs and immigration facilities. However, as some countries have agreements that allow travel between them without customs and immigration, such facilities are not a definitive need for an international airport. International flights often require a more conspicuous level of physical security, although in recent years, many countries have adopted the same level of security for international and domestic travel. Modern engineers and architects are developing "floating airports" that could be located several miles at sea, utilizing designs such as Float Incorporated's Pneumatic Stabilized Platform (PSP) technology. Airport terminal interiors (like this one at Zurich International Airport) increasingly look like small shopping centers. Most international airports have shops and food courts. These services usually provide the passengers food and drinks before they board their flight. Many recognizable chain food restaurants have opened branches in large airports to serve often hungry passengers. International areas usually have a duty-free shop where travelers are not required to pay the usual duty fees on items. London's Heathrow Airport, for example, is home to both a Harrods and a Hamleys Toy Shop, providing Duty Free for international passengers. Larger airlines often operate member-only lounges for premium passengers. Airports have a captive audience, and consequently the prices charged for food is generally higher than elsewhere in the region. However, some airports now regulate food costs to keep them comparable to so-called "street prices." Some airports, such as the Subic Bay International Airport, charge fees for use of their services. The British AirwaysTerraces lounge in Berlin, Germany. Several mid-to-large size airports also have facilities for premium passengers. In the United States, these lounges are typically for international, or long-haul, first and business class passengers, paid members, and elite-level frequent fliers on long haul flights (regardless of what class they are in). In the rest of the world, the lounges are not open to purchase, but can be used by all premium passengers and most elite frequent fliers. Some lounges are comparatively Spartan and only offer a quit place to sit and work; other lounges include meals and massage services. In addition to people, airports are responsible for moving large volumes of cargo around the clock. Cargo airlines often have their own on-site and adjacent infrastructure to rapidly transfer parcels between ground and air modes of transportation. Aircraft maintenance, pilot services, aircraft rental, and hangar rental are most often performed by a fixed base operator (FBO). At major airports, particularly those used as hubs, airlines may operate their own support facilities. Some airports, typically military airbases, have long runways used as emergency landing sites. Many airbases have arresting equipment for fast aircraft, known as Rotary Hydraulic Arrester Gear—a strong cable suspended just above the runway and attached to a hydraulic reduction gear mechanism. Together with the landing aircraft's arresting hook, it is used in situations where the brakes would have little or no effect. Many large airports in the world are located next to or even above railway trunk routes; for instance, Frankfurt International Airport, Amsterdam-Schiphol Airport, London Heathrow Airport, London Gatwick Airport, and London Stansted. For local access, many airports have local train lines, rapid transit, light rail lines, or other mass transit systems, for instance the AirTrain JFK at John F. Kennedy International Airport in New York. These systems are usually directly connected to the main terminals. Large airports also usually have access through freeways, from which cars feed into two access roads, designed as loops, one sitting on top of the other. One level is for departing passengers and the other is for arrivals. This road concept was pioneered at Los Angeles International Airport. The earliest airplane takeoff and landing sites were simply open, grassy fields. The plane could approach at any angle that provided a favorable wind direction. A slight improvement was the dirt-only field, which eliminated the drag from grass. However these only functioned well in dry conditions. Later, they were replaced by concrete surfaces that allowed all-weather landings in both daylight and at night. The first aviation facility to be called an "airport" was Bader Field in Atlantic City, New Jersey. Early airfields were often built for the purpose of entertainment. These "aerodromes (In Britain, Canada, and Australia, the term aerodrome indicates any area of land or water used for aircraft operation, regardless of facilities. In the United States, the term (with this meaning) has become obsolete.) consisted of a grassy field, a hangar for storage and servicing of airplanes, and observation stands for visitors. The first known usage of the term "airport" appeared in a newspaper article in 1919, in reference to Bader Field in Atlantic City, New Jersey. One of the world's first aerodromes was Taliedo Airport in Milan, which was opened in 1910 and in the mid 1920s was transformed into an airport and opened to commercial traffic. It was closed in the 1930s because it was too small for the commercial transportation boom of those years. Linate Airport, which still serves as one of Milan's airports, was then built a few miles north. One of Europe's first airports was S. Darius and S. Girėnas airport (in Kaunas, Lithuania), which was opened in 1915. Increased aircraft traffic during World War I led to the construction of regular landing fields. Airplanes had to approach these from certain directions. This led to the development of aids for directing the approach and landing slope. Following the war, some military airfields were developed into commercial facilities for handling passenger traffic. The earliest such fields included Croydon Airport, in South London, and Le Bourget, near Paris. In 1922, the first permanent airport and terminal solely for commercial aviation was built at Königsberg, Germany. The airports of this era used a paved "apron," which permitted night flying as well as landing heavier airplanes. The first lighting used at an airport was during the latter part of the 1920s. In the 1930s, approach lighting came into use. 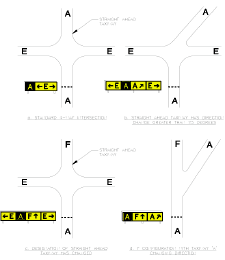 These indicated the proper direction and angle of descent. The colors and flash intervals of these lights became standardized under the ICAO. In the 1940s, the slope-line approach system was introduced. This consisted of two rows of lights that formed a funnel indicating an aircraft's position on the glideslope. Additional lights indicated incorrect altitude and direction. Following World War II, airport design began to become more sophisticated. Passenger buildings were being grouped together in an island, with runways arranged in groups about the terminal. This arrangement permitted expansion of the facilities. But it also meant that passengers had to travel further to reach their plane. An improvement in the landing field was the introduction of grooves in the concrete surface. These ran perpendicular to the direction of the landing aircraft and served to draw off excess water in rainy conditions that could build up in front of the plane's wheels. Airport construction boomed during the 1960s, with the increase in jet aircraft traffic. Runways were extended out to 3 kilometers (km) (9800 feet). The fields were constructed out of reinforced concrete using a slip-form machine that produces a continual slab with no disruptions along the length. Modern landing fields are thickest in the area where the plane touches down in order to support the force of the landing gear touching down. Runways are constructed as smooth and level as possible using measuring devices to correct for variations in height. Most of the world's airports are owned by local, regional, or national government bodies that then lease the airport to private corporations. The corporations in turn oversee the airport's entire operation. For example, the British firm BAA plc operates seven of the commercial airports in the United Kingdom, as well as several other airports outside of the UK. Germany's Frankfurt International Airport is managed by the quasi-private firm Fraport AG. In the United States, most airports are operated directly by government entities or government-created airport authorities (also known as port authorities). Also, all commercial airport runways are certified by the Federal Aviation Administration (FAA) but maintained by the local airport under the regulatory authority of the FAA. Although the FAA has been sponsoring a privatization program since 1996, there is a reluctance to privatize airports in America. Parts of the facilities, however, may be leased to outside firms, to operate specific functions such as retail management and parking. Two U.S. airports entirely operated by private entities are: Indianapolis International Airport, owned by the City of Indianapolis and leased to BAA Indianapolis, Inc. (a subsidiary of the British airport firm BAA plc), and Stewart International Airport in New York's Hudson Valley. Stewart International Airport was the nation's first privatized commercial airport and operates under a 99-year lease agreement with the New York State Department of Transportation. National Express Group, Inc., operates Stewart International Airport and is the United States subsidiary of the National Express Group, plc, in the United Kingdom. In New Zealand, Auckland International Airport, the nation's main international airport, is fully privatized. Ownership and operation of the 1,497 hectare complex is vested entirely with Auckland International Airport Limited, a public company, with the only governmental involvement being Airways Corporation of New Zealand's operation of air traffic control systems. Similar arrangements pertain to Wellington and Christchurch airports, and most other main airports are operated by private companies. 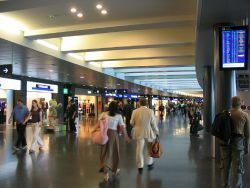 Airports are uniquely represented by their IATA airport code and ICAO airport code. IATA airport codes are often abbreviated forms of the common name of the airport, such as PHL for Philadelphia International Airport. Airports sometimes retain their previous IATA code when an airport's name is changed. 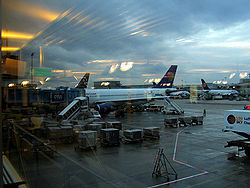 For example, O'Hare International Airport in Chicago retains the IATA code ORD, from its former name of Orchard Field. The name of the airport itself can be its location, such as Los Angeles International Airport. It can be the name of a prominent national celebrity, commonly a politician, e.g. John F. Kennedy International Airport, Ninoy Aquino International Airport, Indira Gandhi International Airport, or Charles de Gaulle International Airport. Airports may also be named after a person associated with the region it serves or prominent figures in aviation history, such as Liverpool John Lennon Airport or Kingsford Smith International Airport, named for the Australian aviation pioneer. Airports are required to have safety precautions in most countries. Rules vary in different countries, but there are common elements worldwide. Airport security normally requires baggage checks, metal screenings of individual persons, and rules against any object that could be used as a weapon. Since the September 11, 2001 attacks, airport security has been dramatically increased worldwide. Outside the terminal, there is a large team of people who work in concert to ensure aircraft can land, take off, and move around quickly and safely. These processes are largely invisible to passengers, but they can be extraordinarily complex at large airports. The vast majority of the world's airports are non-towered, with no air traffic control presence at all. However, at particularly busy airports, or airports with other special requirements, there is an air traffic control (ATC) system whereby controllers (usually ground-based) direct aircraft movements via radio or other communications links. This coordinated oversight facilitates safety and speed in complex operations where traffic moves in all three dimensions. Air traffic control responsibilities at airports are usually divided into at least two main areas: ground and tower, though a single controller may work both stations. The busiest airports also have "clearance delivery," "apron control," and other specialized ATC stations. 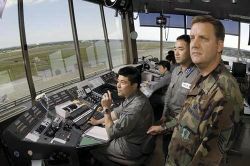 Air traffic controllers inside the control tower at Misawa Air Base, Japan. Ground Control is responsible for directing all ground traffic in designated "movement areas," except the traffic on runways. This includes planes, baggage trains, snowplows, grass cutters, fuel trucks, and a wide array of other vehicles. Ground Control will instruct these vehicles on which taxiways to use, which runway they will use (in the case of planes), where they will park, and when it is safe to cross runways. When a plane is ready to take off it will stop short of the runway, at which point it will be turned over to Tower Control. After a plane has landed, it will depart the runway and be returned to Ground Control. Tower Control is responsible aircraft on the runway and in the controlled airspace immediately surrounding the airport. Tower controllers may use radar to identify and accurately locate an aircraft's position in three-dimensional space, or they may rely on pilot position reports and visual observation. They coordinate the sequencing of aircraft in the traffic pattern and direct aircraft on how to safely join and leave the circuit. Aircraft which are only passing through the airspace must also contact Tower Control in order to be sure that they remain clear of other traffic and do not disrupt operations. All airports use a traffic pattern (often called a "traffic circuit" outside the U.S.) to assure smooth traffic flow between departing and arriving aircraft. Generally, this pattern is a circuit consisting of five "legs" that form a rectangle (two legs and the runway form one side, with the remaining legs forming three more sides). Each leg is named (see diagram), and ATC directs pilots on how to join and leave the circuit. Traffic patterns are flown at one specific altitude, usually 800 or 1000 ft. above ground level (AGL). Standard traffic patterns are "left-handed," meaning all turns are made to the left. Right-handed patterns do exist, usually because of obstacles such as a mountain, or to reduce noise for local residents. The predetermined circuit helps traffic flow smoothly because all pilots know what to expect, and helps reduce the chance of a mid-air collision. At extremely large airports, a circuit is in place but not usually used. Rather, aircraft (usually only commercial with long routes) request approach clearance while they are still hours away from the airport, often before they even take off from their departure point. Large airports have a frequency called "Clearance Delivery" which is used by departing aircraft specifically for this purpose. This then allows airplanes to take the most direct approach path to the runway and land without worrying about interference from other aircraft. While this system keeps the airspace free and is simpler for pilots, it requires detailed knowledge of how aircraft are planning to use the airport ahead of time and is therefore only possible with large commercial airliners on pre-scheduled flights. The system has recently become so advanced that controllers can predict whether an aircraft will be delayed on landing before it even takes off; that aircraft can then be delayed on the ground, rather than wasting expensive fuel waiting in the air. 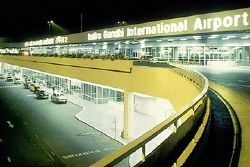 The Indira Gandhi International Airport, Delhi, India is one of the few airports in the world that uses the CAT-3B Instrument Landing System. Before takeoff, pilots usually check an Automatic Terminal Information Service (ATIS) for information about airport conditions where they exist. The ATIS contains information about weather, which runway and traffic patterns are in use, and other information that pilots should be aware of. When flying, there are a number of aids available to pilots, though not all airports are equipped with them. A Visual Approach Slope Indicator (VASI) helps pilots fly a perfect approach for landing once they have found the airport. Some airports are equipped with a VHF omnidirectional range (VOR) to help pilots find the direction to the airport. VORs are often accompanied by a Distance Measuring Equipment (DME) to determine the distance to the VOR. VORs are also located off airports, where they serve to provide airways for aircraft to navigate upon. In poor weather, pilots will use an Instrument Landing System to find the runway and fly the correct approach, even if they cannot see the ground. The number of instrument approaches based on the use of the Global Positioning System (GPS) is rapidly increasing and may eventually be the primary means for instrument landings. Airport guidance signs provide direction and information to taxiing aircraft and airport vehicles and assist in safe and expedient movement of aircraft. Smaller airports may have few or no signs, relying instead on airport diagrams and charts. Location signs—yellow on black background. Identifies the runway or taxiway the aircraft is entering or currently on. Direction/Runway Exit signs—black on yellow. Identifies the intersecting taxiways the aircraft is approaching, with an arrow indicating the direction to turn. Other—Many airports use conventional traffic signs such as stop and yield signs throughout the airport. Mandatory instruction signs are white on red. They show entrances to runways or critical areas. Vehicles and aircraft are required to stop at these signs until the control tower gives clearance to proceed. Runway signs—White on a red. These signs simply identify a runway intersection ahead. Frequency Change signs—Usually a stop sign and an instruction to change to another frequency. These signs are used at airports with different areas of ground control. Holding Position signs—A single solid yellow bar across a taxiway indicates a position where ground control may require a stop. If a two solid yellow bars and two dashed yellow bars are encountered, this indicates a holding position for a runway intersection ahead; runway holding lines must never be crossed without permission. At some airports, a line of red lights across a taxiway is used during low visibility operations to indicate holding positions. On runways, green lights indicate the beginning of the runway for landing, while red lights indicate the end of the runway. Runway edge lighting is white lights spaced out on both sides of the runway, indicating the edge. Some airports have more complicated lighting on the runways including lights that run down the centerline of the runway and lights that help indicate the approach (an Approach Lighting System, or ALS). Low-traffic airports may use Pilot Controlled Lighting to save electricity and staffing costs. Planes take-off and land into the wind in order to achieve maximum performance. Wind speed and direction information is available through the ATIS or ATC, but pilots need instantaneous information during landing. For this purpose, a windsock is kept in view of the runway. Air safety is an important concern in the operation of an airport, and almost every airfield includes equipment and procedures for handling emergency situations. Commercial airfields include one or more emergency vehicles and crews that are specially equipped for dealing with airfield accidents, crew and passenger extractions, and the hazards of highly flammable airplane fuel. The crews are also trained to deal with situations such as bomb threats, hijacking, and terrorist activities. Potential airfield hazards to aircraft include debris, nesting birds, and environmental conditions such as ice or snow. The fields must be kept clear of debris using cleaning equipment so that loose material doesn't become a projectile and enter an engine duct. In adverse weather conditions, ice and snow clearing equipment can be used to improve traction on the landing strip. For waiting aircraft, equipment is used to spray special deicing fluids on the wings. Depending on their configuration, an airport can have sections of their pavement where collisions between airplanes on the ground can tend to occur. Records are kept of any incursions where airplanes or vehicles are in an inappropriate location, allowing these "hot spots" to be identified. These locations then undergo special attention by transportation authorities (such as the FAA in the U.S.) and airport administrators in order to reduce accidents. During the 1980s, a phenomenon known as microburst became a growing concern due to accidents caused by microburst wind shear. Microburst radar was developed as an aid to safety during landing, giving two to five minutes warning to aircraft in the vicinity of the field of a microburst event. Some airfields now have a special surface material at the end of the runway that behaves somewhat like styrofoam, bringing the plane to a relatively rapid halt as the material disintegrates. These surfaces are useful when the runway is located next to a body of water or other hazard, and prevents the planes from overrunning the end of the field. The traffic generated by airports both in the air and on the surface can be a major source of aviation noise and air pollution which may interrupt nearby residents' sleep and produce other noise health effects. The construction of new airports, or addition of runways to existing airports, is often resisted by local residents because of the effect on the countryside, historical sites, local flora and fauna. As well, due to the risk of collision between birds and airplanes, large airports undertake population control programs where they frighten or shoot birds to ensure the safety of air travelers. The construction of airports has been known to change local weather patterns. For example, because they often flatten out large areas, they can be susceptible to fog in areas where fog rarely forms. In addition, because they generally replace trees and grass with pavement, they often change drainage patterns in agricultural areas, leading to more flooding, run-off, and erosion in the surrounding land. An airbase, sometimes referred to as a "military airport" or "airfield," provides basing and support of military aircraft. Some airbases provide facilities similar to their civilian counterparts. For example, RAF Brize Norton in Oxfordshire, England has a terminal which caters to passengers for the Royal Air Force's scheduled Tristar flights to the Falkland Islands. Military airbases may also be co-located with civilian airports, sharing the same tower/air traffic control facilities, runways, taxiways, and emergency services, but with separate terminals, parking areas, hangars, and shelter areas. Examples of this are Bardufoss Airport/Bardufoss Air Station and Gardermoen Airport/Gardermoen Air Station, both in Norway. A special variant of a military airfield is the Aircraft Carrier. An aircraft carrier is a warship that functions as a floating airport for military aircraft. Aircraft carriers allow a naval force to project air power great distances without having to depend on local bases for land-based aircraft. After their development in World War I, aircraft carriers replaced the battleship as the centerpiece of a modern fleet during World War II. Unescorted carriers are considered vulnerable to missile or submarine attacks and therefore travel as part of a "carrier battle group" that includes a wide array of other ships with specific functions. Airports have occasionally played major roles in motion pictures and television shows due to being transportation hubs, but also because of their unique characteristics. One such example of this is the movie The Terminal, a film about a man who becomes permanently grounded in an airport terminal and must survive only on the food and shelter provided by the airport. Movies such as Airplane!, Airport, Die Hard 2, Jackie Brown, Get Shorty, and The Langoliers, as well as television series like Lost also have significant parts of their story set within airports. Each national aviation authority has its own system for pilots to be able to keep track of information about airports in their country. The United States uses the Airport/Facility Directory (A/FD), seven volumes that contain information such as elevation, airport lighting, runway information, communications, hours of operation, nearby NAVAIDs and much more. In Canada, a single publication, the Canada Flight Supplement (CFS) provides equivalent information. The most comprehensive, consumer/business directory of commercial airports in the world (primarily for airports as businesses, rather than for pilots) is organized by the trade group Airports Council International. ↑ Wayne Parry, Atlantic City is trying _ again _ to sell a historic former airport to help pay down its crushing municipal debt Associated Press, March 15, 2016. Retrieved May 29, 2017. This page was last modified on 13 February 2019, at 16:29.